Now you can write the noun Boda Boda with confidence. No need being wary of a grammar wiseacre popping up to remind you that it is not an English word. Of course it will never be one but being recognised it has. The ninth edition of the Oxford Advanced Learners Dictionary has done the service of recognising this noun that is so synonymous with transport in East Africa. The word has been added with the dictionary defining it as “a type of motorcycle of bicycle with a space for a passenger or for carrying goods often used as taxis. And behold, to hit home the fame that boda bodas hold to Kampala, Oxford Advanced Learners Dictionary gives the example of the usage thus: “boys on boda bodas riding on Kampala’s streets.” Clincher! Oxford Advanced Learners Dictionary is regarded as one of the best dictionaries in the world for the learners and users of English. 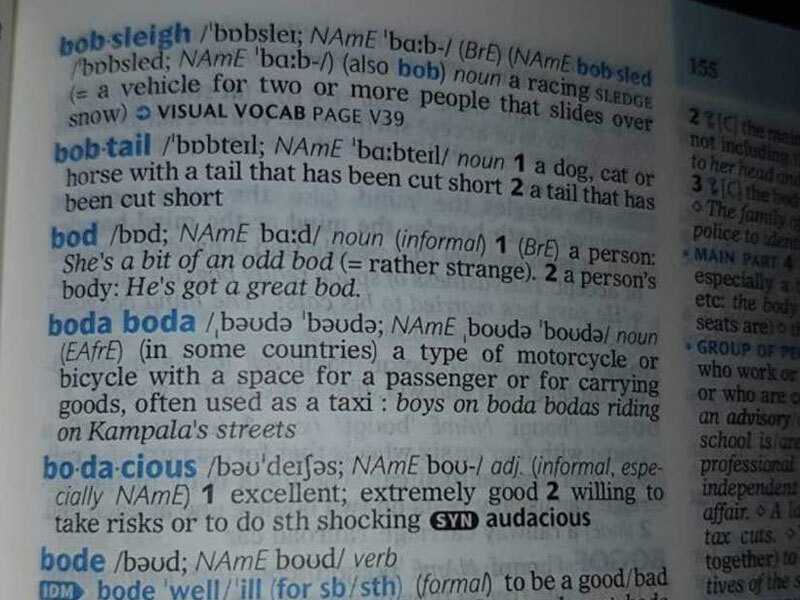 Boda boda is also recognized by the Collins English Dictionary. Boda boda is one of the commonest means of transport in many parts of East Africa, especially Kenya, Uganda and Tanzania (they are called taxi-moto in Rwanda). Various accounts suggest that the name traces its origin to the border town of Busia. Small traders at the Uganda-Kenya border point in the late 1980s to early 1990s needed cheap transport to ferry consumer goods, mainly cooking oil, soaps and other consumer goods from Kenya to Uganda. Initially, bicycles were used, but by early 1990s, motorcycles were becoming more accessible to Ugandan peasants, most of whom started saving to upgrade from bicycles to the engine form of transport.